On 22.12.2010, Siemens published the news that they had found a launching customer for their Vectron platform; Lease company Railpool. In 2012 Siemens delivered six Vectron electrics to Railpool, designated 193 801 to 806. These Railpool locomotives are configurated for both passenger and freight services; The top speed of these dual frequency (15kV and 25kV AC) locomotives is 200 kph and the duration power is 6400 kW. Their weight is 87 metric tonnes and they are homologated for Germany and Austria. They were all built and assembled in Siemens’ locomotive plant in Munich-Allach. In May 2014, it was published that Railpool was sold by its founders to Oak Capital. The deal came with ordering 5 new Vectron locomotives, the designated 193 810-814. In 2015 three more were ordered (183 815-817). In 2016 Railpool again closed a contract for new Vectron locomotives. Five machines were ordered (193 824-828) with an option for ten more. As seen today with a classic TEE train by Thomas Girstenbrei. The Railpool fleet is growing again. Earlier this week we showed you the new 186 292, today the title for newest Railpool locomotive in service goes to Vectron no. 193 826. Timo Albert was able to portray the machine in Würzburg on 19.10.2016. The machine is currently operated by TX Logistik. RTB Cargo has a new logo. Railpool Vectron locomotives 193 806 and 816 are among the first machines that sport the new blue logo. The image above, made by Markus Mittermüller on 29.09.2016 in Enns (AT), shows 193 816 with 810. The old and the new logo pulling one freight train together. Manfred Knappe and Michael Raucheisen were able to shoot the brand new Railpool 193 824 during its one day duty to haul the Meridian replacement train in and around Munich. The locomotive was used as such on 15.07.2016. Lease company Railpool has placed a new order with Siemens for new Vectron locomotives. Five units are being ordered for services in Germany, Austria, Hungary and Romania. The Vectron AC machines have 6.4 MW duration power and a top speed of 200 kph. Railpool already has 14 Vectron locomotives: 193 801-806 and 810-817. There is also an option for ten more machines. The five units ordered directly will be delivered in 2016. Railpool 193 806 recently changed operator. It is no longer in service of EVB, but TX Logistik. It means also the DVS insurance livery is gone. It has been replaced by white stickers promoting TXL. Thank you Kai-Florian Köhn. Austrian rail operator SETG is fanatically applying its green and white stickers on Vectron locomotives. Now we know why the recently delivered ELL 193 240 was plain white. SETG is currently re-styling more locomotives. Both Railpool 193 814 and Siemens 193 821 got a new white and green livery. An image of the 814 with a timber train Lübeck (DE) - Schwaz (AT) on 15.01.2016 made by Patrik Meyer-Rienitz. On 02.10.2015, another new Vectron was seen, to be delivered to Railpool: 193 815. The machine handed over to Railpool on 01.10.2015 and was hired to NIAG until the end of the year. German freight operator EVB has put some extra stickers on Railpool 193 801 and 804. They're searching for new personnel. Railpool Vectron no. 193 803-4, currently in service of e.g.o.o. (Eisenbahngesellschaft Ostfriesland-Oldenburg) got a make-over. It has re-appeared in green and silver, the corporate identity of Enercon, e.g.o.o. 's mother company. e.g.o.o. recently announced the start of the Enercon -Ems-Isar-Express-, a daily service from Ostfriesland via Dörpen/Emsland to München (DE). For the first time, a train service of e.g.o.o. will be used to transport goods from, predominantly, external customers. The five Vectron locomotives that Siemens delivered to Railpool this year, where all handed over in a plain white livery. But lease company Railpool is very strict when applying its corporate identity on rolling stock, so 193 810-814 are repainted in silver and blue one by one. By us, this raised the question, what if Lokomotion had its own Vectrons, what would it look like? We thought this was not planned, but Railpool has indeed restyled the first locomotive from its latest Vectron batch (193 810-814). Unit no. 193 811 is now silver, including its frame, and has blue banners. It gives a total different impression. Only, the Railpool logos are still missing! 2014-07-31 [HU] Railpool 193 812 and 814 have been in Hungary? Check! [HU] Railpool 193 812 and 814 have been in Hungary? Check! Siemens has sold two Vectron locomotives to Paribus Rail Portfolio III. They will be handed over to the customer in December 2013. We already brought the news about 193 922 being repainted in the livery of Railpool. Both locomotives will be hired to a Swedish passenger operator for at least three years, as of December 2013. They will be used for passenger services. blataget.com is mentioned as the operator. The delivery of the first new Vectron locomotive to boxXpress.de is postponed to October. It will be the 193 841. The sun tricked us! Railpool 193 801 still has its Railpool logos! Sorry for the confusion. The Vectron has now received its first homologation for Austria. Following Poland, Romania and Germany, this is the fourth national homologation in Europe. Preliminary homologation has already been issued in Sweden. The homologation process is also underway for further nations, including Switzerland, Italy and The Netherlands. For some time now, EVB/MWB is using Vectron locomotive 193 801 in everyday practice. As from today Railpool 193 802-6 will get the same 'reality check'. A nice set of pictures made today. The original press statement can be found here. Today, Siemens handed over the first locomotive from its Vectron series at an event attended by Martin Zeil, the Bavarian Minister of Economic Affairs. During the ceremony, Railpool took delivery of the first vehicle from Dr. Jochen Eickholt, CEO of the Siemens Rail Systems Division. The Munich-based locomotive leasing company had ordered a total of six locomotives from Siemens at the end of 2010. "This is the first delivery of a locomotive based on our new platform. It is an encouraging signal for our business", Eickholt stressed. Minister Martin Zeil went on to say: "The development of this flexible locomotive concept and the demand it has generated demonstrate the competitiveness of the Bavarian rail industry. The Vectron will make rail transportation even more attractive and take the strain off the road system well beyond Bavaria's borders." At the end of 2010, Railpool was the first company to decide in favor of the newly developed Vectron generation. 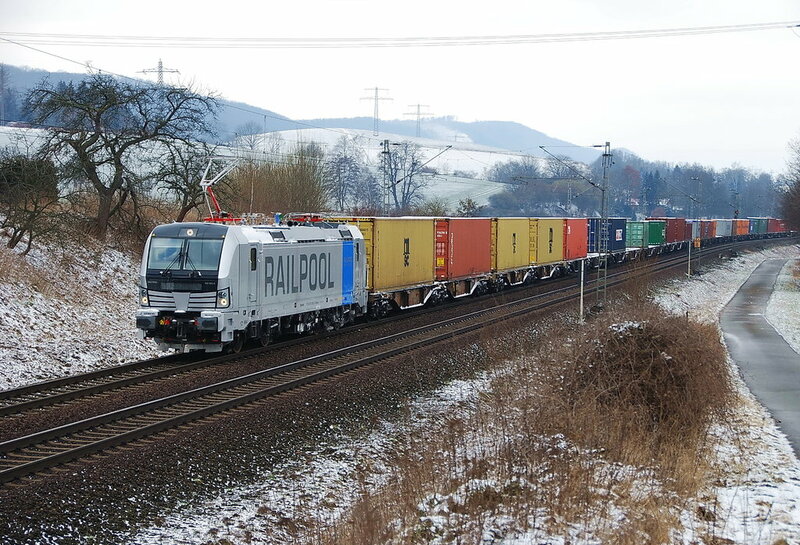 Summarizing the reasons for his firm's decision, Dr. Walter Breinl, CEO of Railpool GmbH, said: "The decisive factor for Railpool was that we can deploy the Vectron in freight, regional and intercity services without restriction – in other words the locomotives are totally interchangeable." The Railpool locomotives have a rated power of 6,400 kW and have been designed to run at up to 200 km/h. The vehicles will be used in cross-border passenger and freight services in Germany and Austria and are equipped with the European Train Control System (ETCS). The locomotives have already been fitted with the wiring for other train protection systems. That means that, in future, their area of operation can easily be extended, for example via Hungary toward Constanta, Romania. The locomotives are being built at the locomotive factory in Munich-Allach, Germany. The Vectron AC locomotives for Railpool are equipped with TMC and WTB multiple traction control with an Austrian remote control concept. Mid-2012, Siemens will deliver the first Vectron locomotive to lease company Railpool. By then, German EBA should have given full approval to the Vectron in Germany. Don't worry, we are not missing out on the new Traxx AC3 from Bombardier. However, we have decided to first make the story complete before we publish. Also have a bit more patience for the interesting details about this project. Big news today, Siemens has found a launching customer for its new Vectron platform. Lease company Railpool has decided to expand its fleet with high-speed locomotives, capable of running with a top speed of 200 kph. Up till now, Railpool only has electric units that can be pushed up to 160 kph.